Unitronic's Intercooler Upgrade Kit for the B8/8.5 A4/A5 is a direct OEM replacement kit with the ability to support 600HP and more! Featuring a massive 20.5" x 4" x 8" bar and plate intercooler core made from T5052 aluminum, T6061 cast aluminum end tanks, proprietary internal fin and louver configuration, and a TIG welded construction. Unitronic's Intercooler Upgrade Kit will resist heat-soak and provide optimal and efficient cooling in any driving conditions. Unitronic’s philosophy in designing Performance Hardware begins with a complete analysis of the OEM component(s) in various street and track environments to determine overall performance characteristics and shortcomings when exposed to performance demanding scenarios. All of Unitronic’s Performance Hardware products are designed using our in-house 3D Scanner, engineering software suites, and data acquisition tools. With these industry leading resources in-house at our disposal, design aspects and fitment tolerances can be extremely precise; up to four one-thousands of an inch (0.004”), often times more precise than manufacturing equipment can ensure resulting in maximum fitment precision on each and every product. After platform constraints and OEM components are 3D scanned, all data is imported into our engineering and modeling software, where we can observe and interact with the parameters to design an upgraded performance product to fit the OEM constraints perfectly, while ensuring the technical aspects relating to performance and engineering principles are deployed. These elements combined allow for less development prototyping, faster validation, and strict quality control. 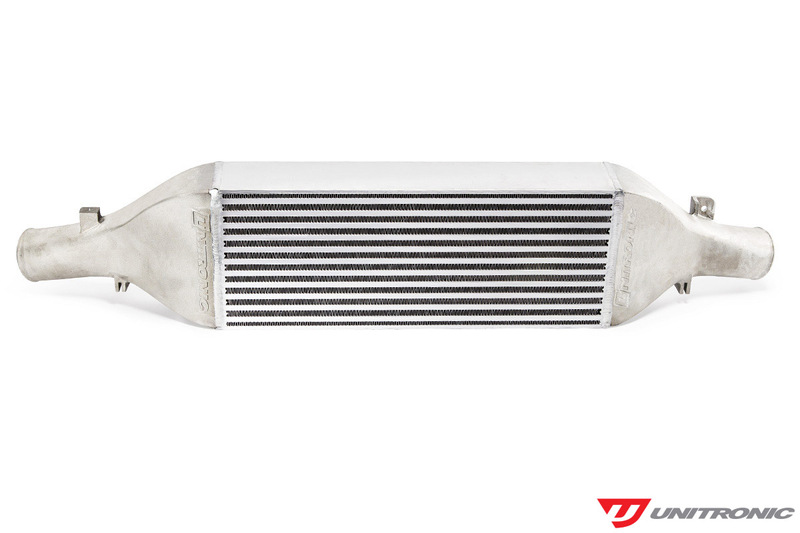 Unitronic’s bar and plate intercooler core is constructed of T5052 Aluminum featuring a unique staggered and louvered fin configuration to maximize efficiency, significantly reducing charge air temperatures allowing for cooler, more dense air to be ingested by the engine; ultimately resulting in an increase in engine performance. When intake air temperatures reach a specific threshold, the engine control unit begins to compensate to account for the air temperature, resulting in a decrease in performance. Unitronic’s core has over 80% more volume than stock measuring 20.5” x 4” x 8” (OEM Intercooler dimensions are 26″ x 2.5″ x 5.5″) allowing for a greater volume of air to exchange heat, which, combined with a proper fin configuration, allows for maximum efficiency and reduction in heat-soak thresholds without producing a significant pressure drop. Entering and exiting the core is an important aspect and should not be forgotten about. 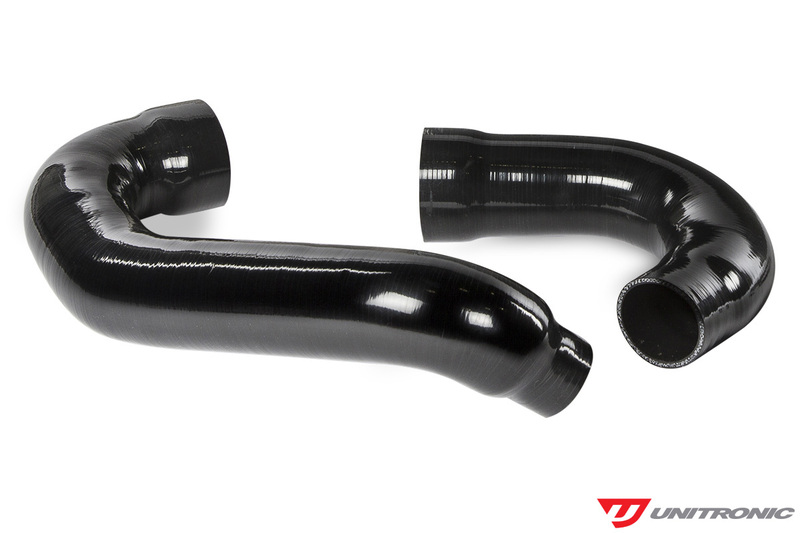 With implications regarding airflow as well as fitment, the end tanks are also something that Unitronic went through many working prototypes and production samples prior to it being approved for production. UUnitronic’s T6061 cast Aluminum end tanks are designed with tolerances of +/- 0.020” to ensure perfect fitment across all of our production units, paying very close attention to its multiple OEM mounting points with the OEM constraints. Inlet and outlet design has also been optimized to ensure smooth airflow through the unit. Utilizing its 2010 Audi A5 2.0 TSI AVS vehicle for research and development provided Unitronic with a platform in-house to run through the testing. Testing was done on the track using appropriate data acquisition tools to collect pre- and post-intercooler air temperatures. All data was collected on the same day, starting with the OEM intercooler testing first. Temperature probes were tapped into the inlets and outlets of both the OEM and Unitronic Intercooler core end tanks. Ambient air temperature varied slightly throughout the day between 23-27 degrees Celsius (73-81 degrees Fahrenheit). Testing was done on the track, performing 3 consecutive laps around the circuit with both the OEM and Unitronic Intercoolers to collect inlet and outlet air temperatures to provide data on cooling abilities, efficiency, and resistance to heat soak compared to the OEM unit. The graph above shows the air temperature delta of the inlet and outlet temperatures of both the OEM and Unitronic Intercoolers. Once again, despite the higher ambient temp during the Unitronic Intercooler runs, and increased inlet temperatures, Unitronic’s upgrade provided significant reductions in outlet air temperatures resulting in a cooler, denser charge air being ingested by the engine, resulting in increased performance. It’s resistance to heat soak means that the core retains its cooling abilities, even though the most rigorous of conditions. Despite the ambient and intercooler inlet air temperatures were higher, Unitronic Front Mount Intercooler Upgrade Kit provided significantly lower intercooler outlet air temperatures consistently throughout the consecutive laps around the circuit, resisting heat soak, unlike the OEM unit. Unitronic's Intercooler Upgrade Kit for the B8/8.5 A4/A5 is a direct OEM replacement kit. 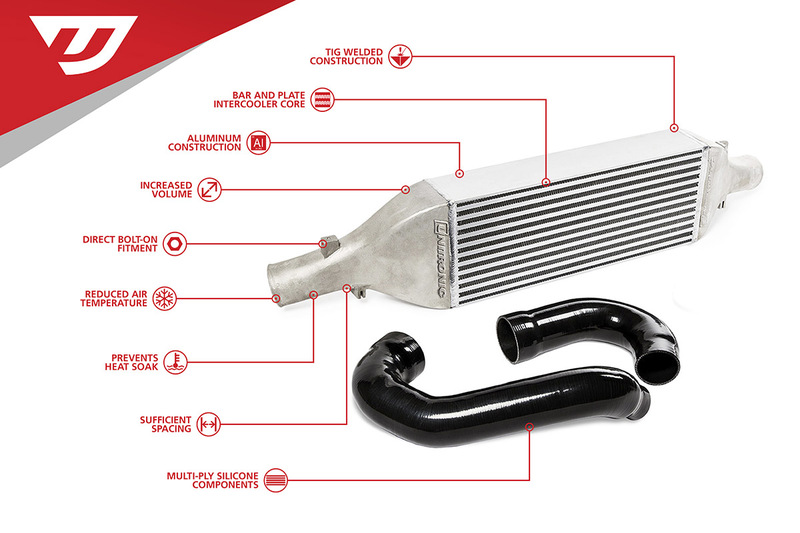 Using 3D modeling technology, Unitronic's Intercooler upgrade is a direct bolt-in upgrade that installs within a matter of hours. Basic mechanical knowledge and tools will accomplish the job.